You know how clean-eating New Yorkers never go anywhere without a bottle of water? Well, water—specifically mineral water—was a huge health trend in the 19th century city too. Drinking and bathing in it was known as the “water cure,” which supposedly could treat fever, digestive complaints, and other body issues, as Ann Haddad wrote in in a blog post for the Merchant’s House Museum. Wealthy New Yorkers took advantage of water curatives hawked by trendy hydrotherapists. They also headed upstate to visit the newly popular mineral spring resort spas. 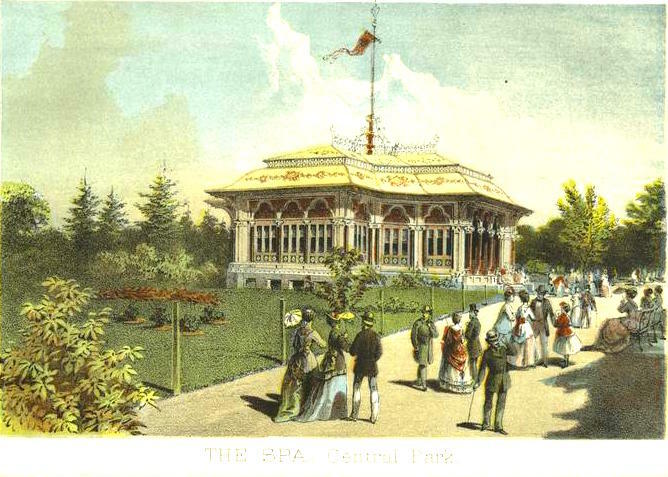 For those of more modest means, an alternative came to Central Park in 1869: a mineral water “spa” that served several different types of spring-fed water. 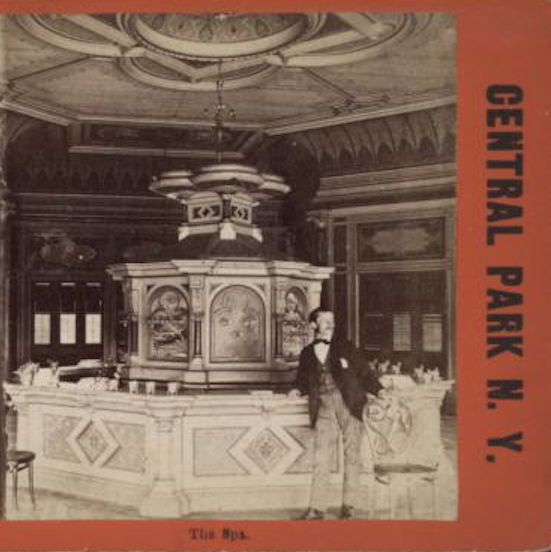 The spa was the idea of a mineral water company owner, Carl Schultz, who (along with doctors touting the powers of H20) petitioned the Board of Health to allow him to open a venue in the park that would dispense water. “The pavilion was erected in 1867 at the request of numerous physicians who felt that here was an opportunity of combining a mineral water cure with exercise in the open air,” recalled Scientific American in 1905. After getting the go-ahead, Schultz had Central Park co-designers Calvert Vaux and Jacob Wrey Mould build a delightful, Moorish style pavilion north of the Sheep Meadow at about 72nd Street. “The waters are of two kinds: first the natural mineral waters from all the famous springs at home and abroad, and second mineral waters prepared artificially and scientifically, thus ensuring a definite chemical combination at all times,” wrote Scientific American. The mineral water pavilion wasn’t just about clean water. It offered “morning summer recitals as an entertainment for the water-ingesting masses,” stated Ann Haddad. 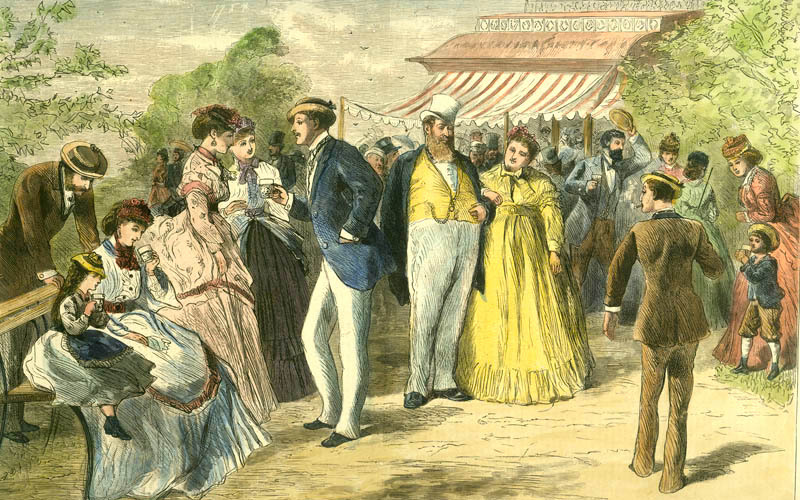 Morning was an especially popular time at the mineral water pavilion, as seen above in an 1872 Harper’s illustration. According to the caption, these were Jewish New Yorkers socializing and enjoying the refreshing water. Trends come and go, of course. 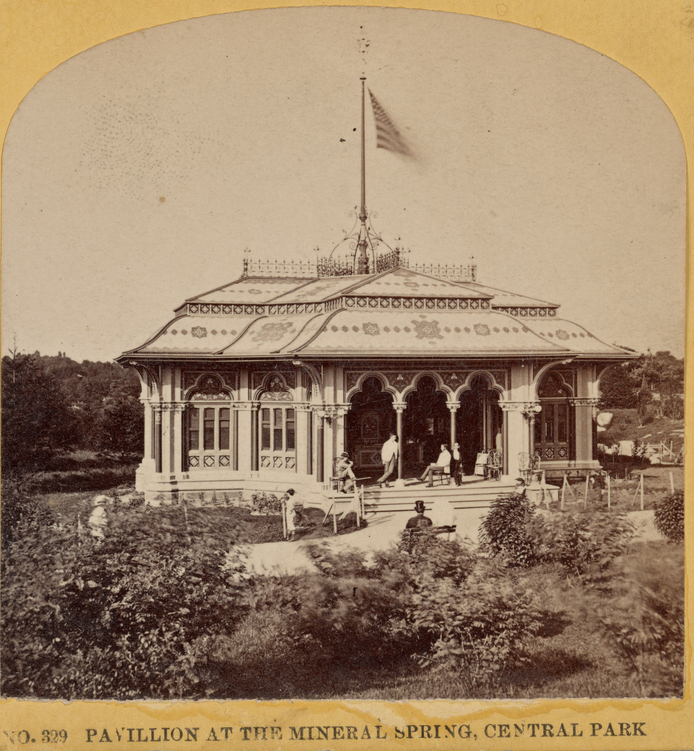 After the turn of the century, with clean Croton-delivered water available to almost every home in New York City, the popularity of Central Park’s mineral water pavilion took a dive. By 1960, the colorful little building with the fanciful roof was demolished. Today, the location is marked on park maps as “Mineral Springs,” a testament to the spa’s 19th century popularity.